Water Conditions: New Melones Lake is currently holding 607,393 acre-feet of water. The lake level dropped two feet this past week. It is currently at 879 ft. above sea level and 206 ft. from full. The water clarity is clear in most of the lake with a slight stain in some areas. The water temperature is gradually rising, with the average being 76-81 degrees. Trout: Fair. The trout bite has been slow during the heat of the day and pretty good throughout the night when temperatures are much cooler. As the lake levels drop the fish will hold in deep water in the main lake and over the river channel. The shad can also be located in the same areas and the trout will feed on them. 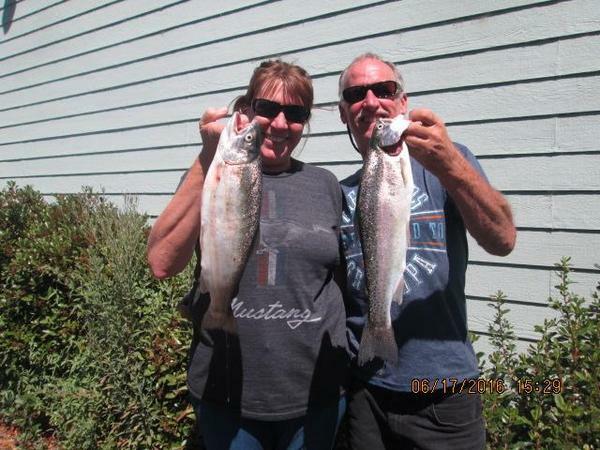 Trolling anglers have been fishing in 50-75' of water to catch trout and kokanee. Try using a kokanee rig to catch both trout and kokanee. If you want to specifically target trout, try using a liplees crankbait or a large shad patterned spoon. When fishing in deep water it is very helpful to use a setup that will produce sound and vibration. Night anglers continue to catch 2 to 3-pound trout while fishing under a submersible light. The light will attract plankton, which attracts small baitfish and then the larger predator fish will soon follow. Most anglers will use live minnows, nightcrawlers and Power Bait to catch them. Look for deep water and channel swings to locate schools of trout. Bank anglers will have better luck fishing some of the lakes and rivers in the high country. 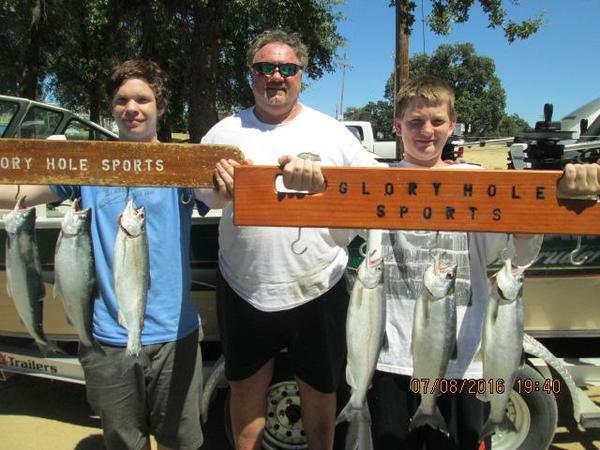 Glory Hole Sports Big Fish of the Week goes to Bob Donofrio of Soulsbyville. 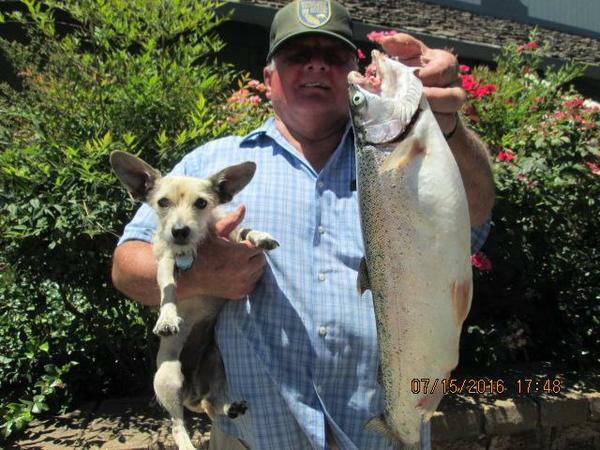 He caught a 3-pound rainbow trout while trolling in 75' of water near the spillway. Roy Spackman of Angels Camp caught a hefty 2-pound, 1-ounce kokanee while trolling a pink hoockie on the main lake. Kokanee: Good. New Melones is kicking out some of the largest kokanee in the state. The average kokanee is over 16" and we have seen some 18" fish. These fish are chunks and some weigh over 2-pounds. The lake record is 2.8-pounds and was caught by Ray Koch of Escalon in 2007. This record might be broken this year if the fish continue to grow as they usually will. The kokanee are starting to school up a bit more and anglers are trolling in 60 to 75' of water to catch them. The dam, spillway and Rose Island are all good areas to target the kokanee and trout. When fishing in deep water it is best to use a setup that will create sound, vibration and disperse water. A large Rocky Mountain Tackle slingblade with a slight bend in it will swing your lure side-to-side and draw strikes. A short leader is also recommended. Vances Tackle dodger is another good choice and will disperse plenty of water and attract fish. Some larger lures have been working well, including full size bladed hoochies, wiggle hoochies and Apex. Pink, blue and purple have been the colors of choice. Darker colors work best in deep water and gold and copper blades have high reflective quality and can be seen from a distance. Scent is also very important and should be applied throughout the day. An Oregon Tackle Scent Chamber tied inline is a good way to ensure your presentation is constantly producing scent. Stop by the store to pick up some dyed and scented corn to add to each hook. This gentleman caught a nice limit of kokanee while trollng a Vance Tackle Dodger with a pink hoochie. A customer sent us this photo of a fat kokanee caught out of New Melones. Bass: Fair. The water level continues to drop making the bass bite a little tougher. Most of the fish have pulled off the shoreline and are holding on deep water structure. The shad are headed to deep water as well and many of the bass will follow them. To catch bass that are keying in on shad try throwing a small swimbait, underspin or umbrella rig. These baits can be used to locate fish and cover water. They can also be fished at practically at any depth. If the fish are not willing to chase, a vertical presentation is the way to go. Try using a dropshot rig with a small shad patterned soft plastic or a jigging spoon. The topwater bite is slow but there is always a chance to get a few blow ups in the mornings and evenings. Many fish will start to target the crawdad population at this time of the year. A football jig is a good bet to catch these crawdad eaters. Also try using a Burner Craw, Mad Yabbie or Brush Hog to shake on the bottom and mimic the action of a crawdad. Be sure to keep your bait on the bottom and to make contact with any brush or rock. This will attract nearby fish and often draw strikes. Try adding a little crawdad scent to your bait when fishing in low light conditions and in stained water. PLEASE PRACTICE CATCH AND RELEASE. Take photos and carefully release the fish back into to the lake to maintain a healthy fish population for generations to come. Glory Hole Sports Big Fish of the Week goes to Curtis Shepherd. He caught a large 11-pound, 7-ounce catfish while bank fishing at night. Crappie: Good. The crappie are biting and can be caught during the day or at night under a submersible light. The crappie are holding in main lake pockets, coves and creek channels. Try using a mini jig, artificial minnow or grub fished under a slip-float to target them.